The Dean Nature Sanctuary is an important recreational and ecological component in this region. The area is a unique combination of ecosystems, with oak savannah, wetland, pond, and prairie habitats living in very close proximity. 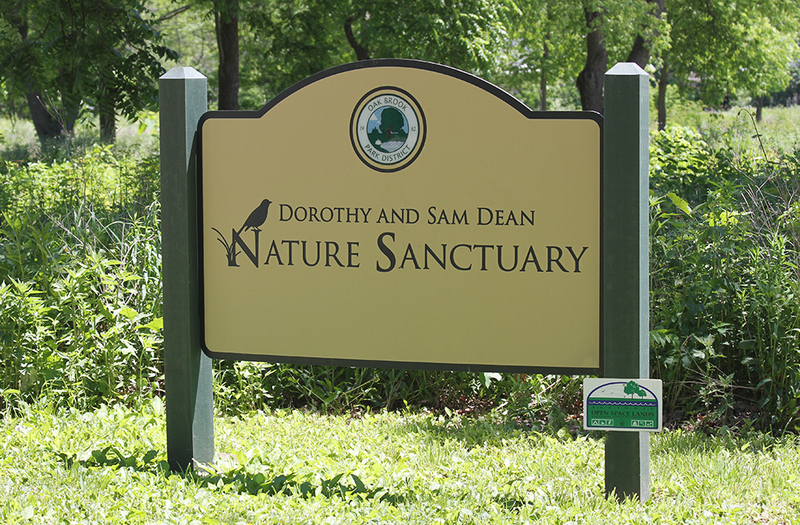 To protect this diversity, the Dean Nature Sanctuary will forever be a "passive park" - meaning the property will not house athletic fields, traditional playgrounds, or recreational facilities. The Oak Brook Park District is working with Sweet Comb Chicago to establish a healthy apiary, or land for bees. Micro apiaries, such as the one here at Dean Nature Sanctuary, give honeybees vital access to native and nutrient rich pollen necessary to cultivate healthy colonies. Honeybees pollinate many of the plants which produce the food consumed by humankind. Examples of plants pollinated by honeybees include almonds, apples, blueberries, cucumbers, melons, and pumpkins. A lack of feral honeybees over the last several years has greatly increased the need for managed honeybees to be used for the pollination of plants. When the hives produce enough honey that it can be harvested without risking the health of the colony, the community will have the opportunity to purchase this hyper-local product through the Oak Brook Park District Foundation. The foundation will utilize the funding from honey sales to help to support the mission of the Oak Brook Park District, enhance the growth and preservation of parks, open lands, and increase recreational programming in Oak Brook. When available the honey may be purchased at the Family Recreation Center and Tennis Center. The cost for 1/2 lb of honey is $10. OH! Bee Parks Honey is 100% raw and all natural. It is harvested, strained, and bottled by hand at the Oak Brook Park District. Studies have shown that honey is packed with antioxidants, is a natural cough suppressant, has anti-inflamatory properties, may help lower cholesterol and help heart health, and provide a boost to the human immune system. It has also been shown that hyper-local honey may help allieviate the symptoms of seasonal allergies. It is important to remember that honey should never be given to children under 1-year. Thank you to our generous Apiary Sponsors! Are you interested in sponsoring a beehive? Contact Liz Littwin, Corporate and Community Relations, for more information at LLittwin@obparks.org or 630-645-9521.